It’s going to be New Year soon, but that doesn’t mean that you’re going to stop all the romance and shift your focus to fireworks and countdown parties. You always have the option of spending New Year with the person you’re in love with, so we have a bunch of New Year date ideas for you. After all the rush that Christmas brought, you’re going to have to face invitations for countdown parties. But, here’s a nice idea: why not spend the New Year with the person you’re with now? Don’t worry about the planning because we’ve compiled some New Year date ideas for you to try on New Year’s Eve. Do you have sleigh rides in your city during the holidays? It’s one way to create a romantic mood as you count down the last few minutes of the year. If you want you can bring a bottle of wine to enjoy while you stroll around the city. A DIY romantic dinner has to be included in this list of romantic New Year date ideas. Cook for your partner, prepare wine and cheese and don’t forget to light up the fireplace and some candles to set the mood. You can’t really create a romantic mood when there are a lot of people around. So, if you and your partner want to enjoy the fireworks display in your city, you simply have to find a rooftop. Check your apartment, or better yet, ask a friend who knows a rooftop spot you can hang out at for the night. If you live in the city, there should be plenty. The view’s going to be amazing if the rooftop is high enough. When the time is right, plant a kiss on your significant other’s cheek. 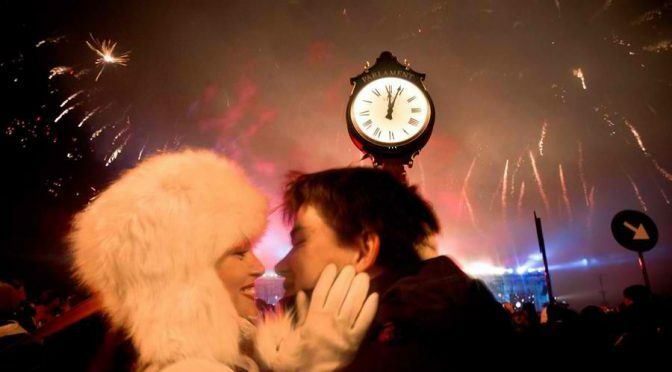 The three romantic New Year ideas we have on this list are simple ideas. There’s so much more you can do, so be creative and put some effort into it to make your partner happy during the first day of the New Year. For more relationship tips and dating advice, don’t hesitate to visit our blog. We have more posts there. Have a wonderful New Year!